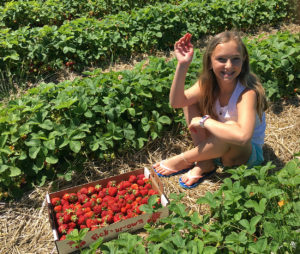 Last week we made our annual trip to the berry farm to pick strawberries. It was the perfect day to pick berries…dry and sunny, with a slight breeze blowing. 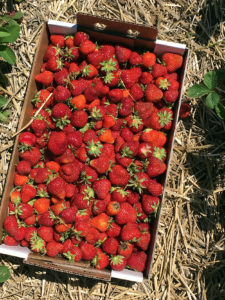 We left the strawberry patch with over 20 pounds of freshly picked berries! I’m sure you can guess what happened once we arrived home with all those berries! Yes, we did some baking and a little more baking! There’s nothing like fresh strawberries to bake with…so sweet and juicy. 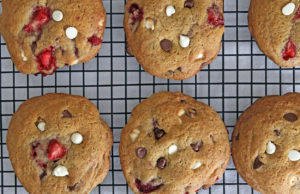 Today, I’m sharing a yummy recipe for Strawberry Chocolate Chip Cookies. If you like a soft cookie, you will love these! 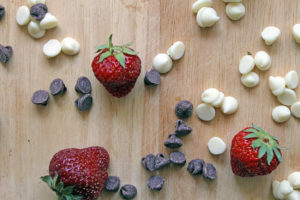 And they combine those sweet strawberries with the flavor of two types of chocolate. Yes, I said TWO kinds of chocolate…milk chocolate and white chocolate. And look how pretty they are…so colorful with all those flavors! Have I tempted you yet? 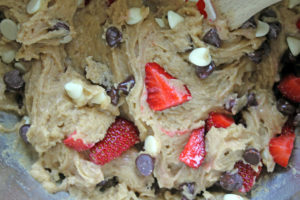 The printable recipe is below…so grab it, and get berry picking and baking! Preheat oven to 370 degrees. Line baking sheets with parchment paper and set aside. In a large bowl, cream together the butter, sugar, brown sugar, and vanilla using an electric mixer until combined. Add the eggs one at a time, mixing between each egg. Add flour mixture and mix until just combined. Be careful not to overmix. 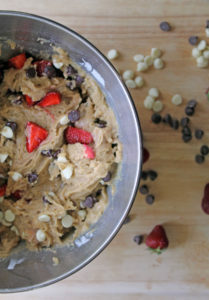 Using a spatula, stir in the strawberries and chocolate chips until combined. Using an ice cream scooper, scoop dough into balls about 2 tablespoons each and place onto prepared baking sheet. Bake for 10 minutes, or until golden brown around the edges. 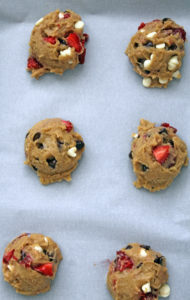 Immediately after taking cookies out of the oven, place some additional chocolate chips on top of he cookies. Let cool for 5 minutes on the baking sheet before moving them to a wire rack.